This hands-on dad has something important to say to those who think that fathers taking care of their own children are simply ‘babysitting’ their kids. Jeremy and Jessica Martin-Weber are proud parents to six daughters, living in Portland, Oregon. They blog over at BeyondMoi about their life together, sharing the responsibilities of providing for the family financially, contributing to homeschooling, and co-parenting their active and busy children. Jeremy and Jessica describe their partnership as an ‘egalitarian marriage’ – meaning that they take an equal role in parenting, finances, homeschooling, and all the other things that come with life as a working, married couple with children. When Jessica needed to head interstate for a few days for work, it was left to Jeremy to manage the family while she was away. 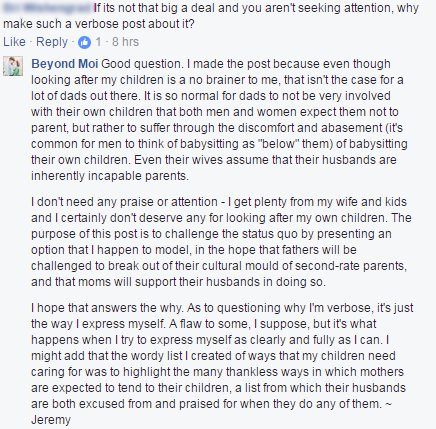 This was no big deal for them, but Jeremy is very aware of the prevailing opinion that dads who take an equal part in caring for their children are simply ‘babysitting’ them. So he decided to share his thoughts in a post on their blog’s Facebook page, and it has sparked not only lots of support but also a few disgruntled readers who have taken his post as a chance to seek attention. Who is going to do all that stuff while mum is away? Jeremy starts his post by listing the many things he will have to manage while his wife is away – from cooking and managing the many routines of their large family, to listening, comforting, conflict resolution – basically all of the things that parents need to deal with every day. “Who is going to do all that stuff while their mom is away?” he asks. Jeremy says that he loves every moment of it, and that he and the children will indeed manage just fine during his wife’s absence. Attention seeking or awareness raising? Jeremy’s post attracted many comments of support and admiration from their online community, however, some readers accused the dad of attention seeking, asking why he felt the need to post about it on social media, rather than simply keeping it to himself. Jeremy pointed out that even though looking after his children is a “no-brainer” for him, many dads still feel it is ‘beneath them’ or not their role to take an active role in parenting and raising their children. And in fact, that even some women assume that their husbands are “inherently incapable parents”. Jeremy wants to challenge that status quo by raising awareness of the way he approaches his role as father to his children and partner to his wife. Jessica also chimed in, in defense of her wonder-hubby. It’s so encouraging to see this gradual shift in parenting roles occurring, finally. How great would it be if mums and dads were treated equally and took on equal roles when it came to raising our children and running our households? Mums might feel more able to return to the workforce (if that is their desire) and dads may gain more confidence in their fatherhood role. Both parents may receive equal support and encouragement, rather than only one being praised for their efforts, and the other feeling unacknowledged. Our children, too, will grow up seeing both parents taking equal and active roles in everything from parenting and finances to schooling, cooking and cleaning. This can only lead to a more equal future for them when (and if) they become mothers and fathers themselves. We’re with you, Jeremy and Jessica! Isn’t it about time we stopped calling dads who look after their own children ‘babysitters’? Do you and your partner parent your children equally? Tell us how it works at your place.